Features Workforce Development Can Workforce Development Close the Skills Gap? Manufacturing is experiencing a much-appreciated resurgence amid a growing economy, but this positive news only highlights a persistent and growing problem – we have a shortage of skilled workers to accommodate this growth. Younger generations are far less likely to pursue a career in manufacturing than their parents and grandparents, and coupled with a lack of modern technical training and exposure, even those well-suited to skilled manufacturing work are unlikely to discover the job opportunities on their own. In an effort to close the growing national skills gap, some manufacturers are taking it upon themselves to generate their own talent pipeline by partnering with local school districts, community colleges, and nonprofits in the form of technical training programs designed to fill badly needed manufacturing positions and give the next generation a better shot at the American Dream. Allis Roller is one of several enthusiastic program participants allowing local high school students to take technical training classes at their facility while working as apprentices for the company. 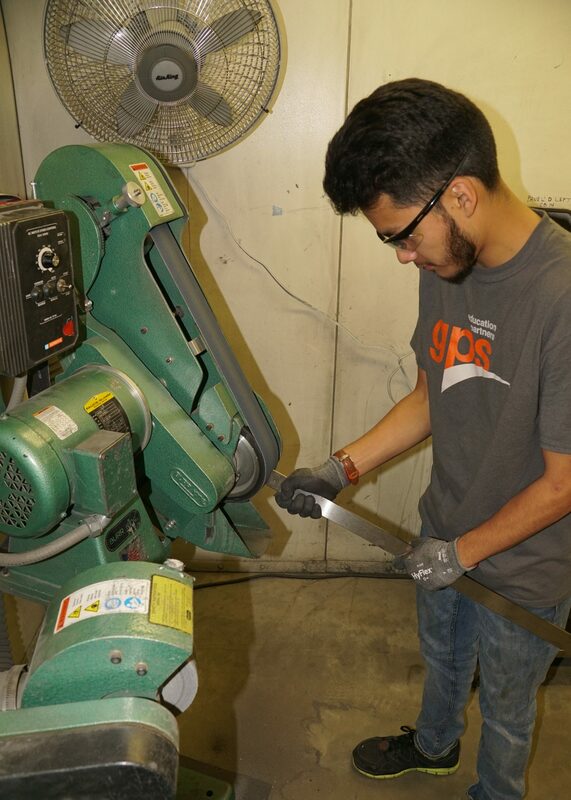 The technical training classes offered at Allis Roller are part of a curriculum created by GPS, which is designed to fit into existing secondary education requirements. The time student program participants spend outside the classroom on Allis Roller’s shop floor provides them hands-on experience with CNC Machining, welding, and complex machined parts manufacturing. By the time they graduate high school, these student-apprentices are immediately employable in well-paying manufacturing jobs and receive a MSSC Certified Production Technician Certificate. According to Troy Wolfson, a GPS program graduate, he learned about the training opportunities available through the GPS-Allis Roller Partnership after a friend “spoke highly of the program.” Though Wolfson had never previously considered a career in manufacturing, the experience he gained at Allis Roller has peaked his interest in global manufacturing, and now he intends on seeking out additional education and career growth opportunities in the manufacturing industry. The more manufacturers pair up with their local education systems to provide technical training to students, the more they help to build up a talent pipeline that the entire community of US manufacturers can collectively benefit from. Individual investment on the part of manufacturing businesses is essential, because protecting the future of American manufacturing is going to take a village. These efforts help provide upward mobility to motivated employees and a more cohesive workforce. Classes include learning software, technical skills, supervisory skills, and more. Enhanced morale and motivation absolutely have a measurable impact on the overall success of a manufacturing company, and improve the quality of one’s existing workforce. The greatest benefits to students are the economic opportunities that can stem from this early technical training. The technical classes they take while still enrolled in high school allow them to be immediately employable after graduation, and without the tens of thousands of dollars in student loan debt that saddles the average bachelor degree holder. For young adults seeking the financial independence that results from a debt-free education, these types of alternative educational programs are particularly attractive. 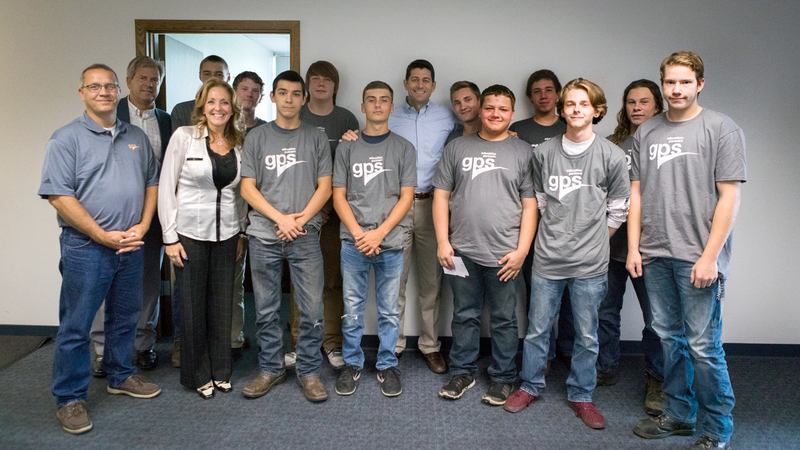 Kevin McKenna (GPS), Stephanie Borowski (GPS), David Dull (Allis Roller), Speaker Paul Ryan and students from GPS Educational Partners. Speaker Paul Ryan went to Allis Roller and conducted a Town Hall Meeting last fall where he discussed, among other items, workforce development. According to Rutgers University, students who go on to complete technical training at a trade school have job placement rates close to 100%, where rates for college graduates with bachelor’s degrees are close to only half that. Compare that statistic with the economically crippling amount of national student loan debt ($1.48 trillion) carried by 44.2 million Americans, and it’s impossible to deny that taking advantage of lower-cost, and often shorter technical training programs provides significant advantages. “Manufacturing is one piece of the puzzle, but we’re expanding to include construction and HVAC partnerships. We’re also partnering with the Boys and Girls Club, to reach even younger students. You have to nurture students’ interest in STEM fields, so that when they are the right age to start making career decisions, they already have that exposure and desire to learn more,” explains Stephanie Borowski, President and CEO of GPS Education Partners. Though closing the skills gap and attracting talent remains a daunting prospect, it’s becoming increasingly apparent that individual manufacturers will have to start their recruiting efforts long before they need to fill a position in order to get more students interested and qualified to enter the industry. Companies like Allis Roller have figured that out, and their participation in technical training partnerships with GPS are just one example of how the manufacturing industry can compete with white collar industries for the future generation’s labor force. After all, universities spend countless resources recruiting and attracting students. With the right strategy, manufacturers can cut through the lure of campus life by showing that technical training provides just as much of a promising future. For more information on Allis Roller, visit www.allis-roller.com. For more information on GPS, visit gpsed.org.